(Al Hartmann | The Salt Lake Tribune) MIT professor and and director of Biomechatronics research group Hugh Herr speaks at a news conference at Utah Valley University on Tuesday, March 7, 2018. He later spoke to the student body as part of the 2018 Presidential Lecture Series. He lost both his legs in a winter-related accident on Mount Washington in New Hampshire. Devastated by his amputations and the death of one of his rescuers, he dedicated his life to developing bionic limbs for amputees and augmenting human capability through bionics. 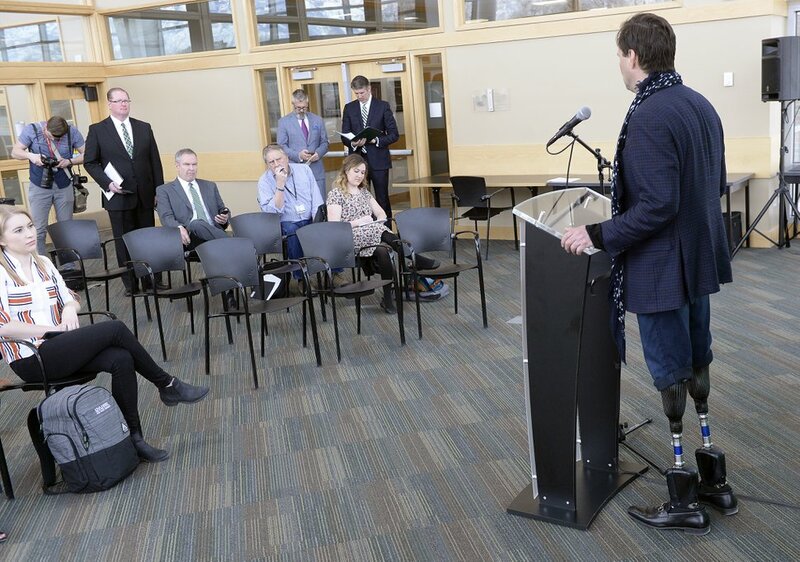 Orem • On Wednesday, I drove to Utah Valley University for a news conference featuring Hugh Herr, professor and director of the Biomechatronics research group at the Massachusetts Institute of Technology. I wasn’t going to go. From the news release, it obviously had something to do with science. While I’m aware that science exists, I don’t understand much beyond the fact that banging two rocks together and saying the appropriate prayer will cause fire to miraculously occur. According to the release, Herr’s work is revolutionary in marrying “human physiology with electromechanics,” a concept I thought already existed and was referred to as a Taser. I was about to throw the paper away but then noticed Herr is a double amputee who uses fully functional bionic legs. He lost the originals in a climbing accident when he was younger, but now uses his new ones to scale mountains even better than before. In short, he had actually improved on the original design. Magic legs. This I had to see. On my way to UVU, I pondered the possibilities. If I could replace any part of my body with a super-improved bionic version, would I do it? Give it a think. Might be cool to have an arm strong enough to strangle a hippopotamus or an ear capable of registering a mouse fart from a thousand yards away. What if you could transfer data to a computer using a highly improved eyeball? I bring this up because upgrading our parts may be possible sooner than we think. When I say “parts,” I am not talking about silicon butts, catcher’s mitt lips or breast jobs. Those may (or may not) make you look better, but have no function beyond attracting the attention of the sort of people who might need a good slap. I acknowledge being a little freaked out when Herr walked into the room. If the legs of his slacks hadn’t been rolled up to his knees, I wouldn’t have guessed that he had bio-whatever legs. He moved so naturally. Seeing him in action was a bit like watching a movie made with computer graphics. I knew it was happening but my brain kept looking for a glimpse of the blue screen behind him. The way I see it, the drawback of having a bionic anything is that it doesn’t include the sensation of touch. You can’t feel with it. Not right now anyway. According to Herr, scientists are working on — and making real advances — in marrying the physiological with the machine-alogical. Eventually, with receptors to the right parts of the brains, the sensation of touch will be capable in new limbs. Wow. Imagine being able to cradle and feel a newborn in your mechanical arms? All of this has darker sides to it, the first being cost. According to Herr, getting insurance and health care companies to play along with the idea is proving to be problematic. The tab for a new hand might price insurance out of reach. Then there’s the possibility that human beings — known for our destructive self-indulgent behaviors — would start upgrading ourselves just for fun. Which upgrades might depend on the stage of life. When I was a teenager, it would have been cool to have a bionic arm capable of throwing a football half a mile or fingers that could play a guitar like Clapton. Then there’s the just plain vulgar. How about a bionic … ahem, libido? What guy wouldn’t want that? What am I talking about? When I was a teenager, I DID have a bionic libido. Now that I’m older, I’m still focused on body parts in that region. When it came time for me to ask Herr a question, I inquired into the possibility of a bionic bladder. I was tired of getting up in the middle of the night. He said that particular upgrade eventually would be possible, but as of yet there was no rollout date.